The challenge with dual fuel conversions is optimizing ignition timing for each fuel. It is not good enough to just rotate the distributor on older vehicles to get the optimum advance curve because these engines generally could use more initial advance to quicker and at a lower RPM than a gasoline advance curve. Regarding timing advance, the PN40622 is designed to give an additional 8-10 degrees of advance, after the distributor is recurved. LPG/CNG-specific Timing Advance Processors (TAPs) for older carbureted vehicles are now obsolete. The simplest solution for carbureted dual fuel applications is to determine which fuel is used most often and optimize the timing advance for that fuel. Operation on the lesser-used fuel (ie, gasoline) will have somewhat lower fuel economy, which would be added incentive to return to LPG/CNG operation. The key getting the best power and fuel economy in any engine is to have the spark occurring at the point in the combustion cycle that generates the maximum torque on the crankshaft at all times and this requires adjusting your initial, centrifugal, and vacuum advance. A good starting point with LPG is the 14-14-14 rule: 14º initial, 14º centrifugal, 14º vacuum. Adjust for best power (initial & centrifugal) and then for best fuel economy (vacuum). Bear in mind that fuel mixture changes can require changes in ignition advance. Why convert to GM 4-pin HEI for older vehicles? GM introduced the 4-pin HEI system to help it meet emission regulations back in 1974. The 4-pin HEI module is compatible with other variable reluctor electronic ignition distributors of other makes. The 4-pin HEI module was designed to fully saturate (charge) the coil at normal engine speeds and includes dwell-control and current-limiting circuitry, which avoids the need for a ballast resistor. A fully saturated coil provides a long, hot spark that allows for wide (0.045") spark plug gaps to ignite lean fuel mixtures with EGR. HEI modules are very reliable and the elimination of the ballast resistor further increases the reliability of the ignition system. 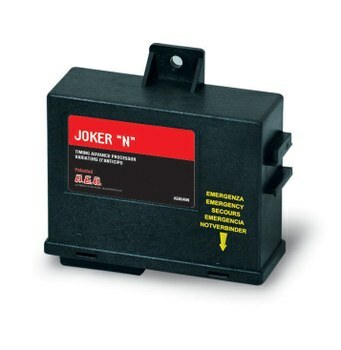 Replacement modules are inexpensive, readily available, and easily replaced. Like ballast resistors, it is still a good idea to keep a spare in the car just in case. How does the GM 4-pin HEI system work? See GM four pin Module and HEI/High Energy Ignition. Autosport Labs developed its standalone MegaJolt ignition system. It is a fully computerized ignition system meaning that you can program any amount of ignition timing based on RPM and load (manifold vacuum). The MegaJolt ignition system is based on the crank-triggered Ford EDIS (Electronic Distributorless Ignition System) and your distributor is no longer used. Since MegaJolt relies on Ford EDIS components, you can save money on the conversion by sourcing used parts. The MegaJolt ignition system is ideal for dual fuel applications because the ECU allows the use of two ignition maps that are selectable with an external switch. The system is configured with a free downloadable software from Autosport Labs and there is support available through MegaJolt discussion forum. The Ford EDIS is a waste spark ignition system, meaning that it a distributorless ignition system that uses a one coil per pair of sparkplugs, which are connected in series through the coil. Besides being able to create one or two, selectable on-the-fly ignition maps, distributorless ignition systems allow a hotter spark because the ignition module has more time to keep a coil saturated for only two cylinders instead of 4, 6, or 8. This allows for higher maximum engine speeds the GM 4-pin HEI module. The two sparkplugs attached to each coil are 360° apart in the 4-stroke cycle. The cylinder on the compression stroke (event) automatically gets the hotter spark because the compressed fuel mixture has a higher voltage requirement than the exhaust stroke (waste) because the exhaust stroke's lower cylinder pressure and presence of ionized gases. In addition, because the sparkplugs are connected in series, the event sparkplug has the correct negative polarity while the waste sparkplug has the opposite positive polarity. The hardest part of converting to the Ford EDIS is the addition of a 36-1 tooth trigger wheel on the crankshaft and the crank position sensor (Variable Reluctor pickup) to a suitable location on the engine. While the EDIS module and coil pack(s) can be mounted in any convenient area on or near the engine, the MegaJolt controller should ideally be mounted inside the vehicle's cockpit. This will necessitate drilling two holes: MegaJolt wiring harness & vacuum hose. A member of the Slant Six Forum successfully used a MegaJolt ignition on his mono-fuel propane 1981 Dodge W150 pickup truck. See Propane Truck Update. Tom Jennings has an excellent write-up about converting his Rambler Roadster (started off as 1961 AMC Rambler American 330) with a 195 cid inline 6-cylinder engine from distributor ignition to MegaJolt Lite Junior (a early version of the MegaJolt system). See Rambler 195.6 ignition. MegaSquirt was designed by Bruce Bowling and Al Grippo in 2001 and is a general purpose aftermarket electronic fuel injection system popular with DIY automotive enthusiasts. It is designed to use components reused from the existing vehicle or sourced donor vehicles This means that MegaSquirt EFI systems can use a much wider variety of components than the MegaJolt system. Although MegaSquirt EFI controllers are engine management systems that can control both fuel and ignition, they may be used ONLY for ignition control if required. The most economical version of the MegaSquirt system is the MicroSquirt system. Similar to MegaJolt, the recommended location for the MicroSquirt controller is inside the vehicle cabin, away from direct engine temperatures because of its 185°F (85°C) maximum temperature limit. While MegaSquirt systems also require technical expertise for installation and configuration, they are somewhat more of a bolt-on system than MegaJolt. While older electronic ignition systems rely on mechanical components (centrifugal weights & springs, vacuum pods) for the control of timing advance, MegaSquirt uses a later distributor with no centrifugal and vacuum advance. An earlier distributor with an electronic VR Sensor may be converted computerized use by locking out the centrifugal and vacuum advance. Alternatively, many later factory locked-out distributors may be directly bolted into the engine without modification. Correctly modifying an old distributor to give a reliable tach input may well be more difficult than adding a crank trigger wheel and will never be as accurate. You are advised to consider installing a crank trigger wheel (e.g. 36-1) and sensor instead. The code required to control fumigation fuel mixtures with a vacuum solenoid varying "atmospheric" pressure on the converter (ie, Dual Curve or Impco) or one or two stepper valves/motors (Technocarb or AEB) is different than what is require for fuel injection. If this code were written, the MicroSquirt controller would be ideal for fuel mixture and ignition timing control of LPG & CNG fumigation systems.